Fortune partnered with AccountAbility, Csrnetwork and Asset4 to rank the world's 100 largest corporations by the quality of their commitment to social and environmental goals. Here's what makes the top 10 stand out. 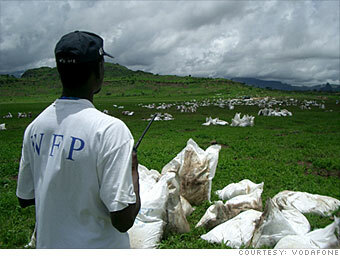 A World Food Program worker coordinates food distribution during a humanitarian crisis. The Vodafone Group Foundation is working with the WFP and United Nations Foundation to make it easier to set up communications networks during major emergencies and disasters around the world. The British cell-phone provider reclaimed the top spot in 2008 (it ranked No. 5 last year and No. 1 in 2006) by upping its green game. Vodafone in April said it would chop its carbon dioxide emissions in half by 2020; the company plans to do so largely by improving the energy efficiency of its global mobile-phone networks. Vodafone also gets good grades for reporting the details of the campaign - and whether or not it's going well - on a continuous basis. Such transparency apparently is part of the Vodafone culture: The firm reports its progress on past commitments, but also discloses deadlines for future promises, such as its pledge to recycle 95% of network equipment waste (March 2009) and plans to reduce work-related accidents that cause lost time by 10% (March 2011). Vodafone engages stakeholders on issues related to global competitiveness, and asks for their input in creating new products. Consequently, the business is a leading innovator of socially responsible products: Recent offerings include text-to-speech software for blind people and easy-to-use handsets for the elderly.